Aims: The aim of the present study was to determine the canal configuration and the prevalence of “C-shaped” canals in mandibular second molar in Central and South Gujarat population. Materials and Methods: A total of 122 mandibular second molar teeth were collected and stored in 10% formalin. Identification of these teeth as mandibular second molar was confirmed by two independent observers. An endodontic access cavity was then prepared in each tooth. Then, they were injected with India ink and demineralized, they were made clear and transparent with methyl salicylate. Then, anatomy of their canals was studied. Results: Out of 122 mandibular second molars, prevalence of “C-shaped” canals was 10.65% (13 teeth). These configurations were seen mostly in single-rooted mandibular second molars. Out of five categories of “C-shape,” predominantly found category was (C1) – 46.15%. Conclusion: Hard tissue of mandibular second molar contains dental pulp which can take a variety of configurations and shapes. The great differences reported among studies with regards to anatomy of the mandibular second molars and prevalence of “C-shaped” canals may be attributable to study methods and racial differences. Objectives: The aim of this study was to compare manual and two nickel titanium (NiTi) rotary retreatment systems in removing gutta-percha obturated with two different sealers. Materials and Methods: Sixty extracted, human, single-rooted mandibular premolars were selected. Endodontic treatment was performed using ProTaper Universal NiTi rotary instruments. Half of the samples were obturated with Tubliseal and remaining half were obtutared with AH Plus sealer with cold lateral compaction method. Subsequently, twenty teeth were retreated with manual retreatment system, and each twenty teeth was retreated with two different rotary retreatment systems. The roots were then grooved longitudinally, and both root halves were subjected to assessment under stereomicroscope, and images were taken with a digital camera. These images were evaluated for residual obturating material using AutoCAD software. Analysis of variance test and Bonferroni multiple comparison test were used for statistical analysis. Results and Conclusion: Results of the present study showed that no system was able to completely remove all debris from the root canals. The minimum amount of debris was seen in the group obturated using Tubliseal sealer and retreated with Hyflex NT retreatment system followed by Mtwo retreatment system and finally the manual retreatment protocol. Regarding the time taken, Mtwo retreatment files took least time to remove the obturating material in all sealer groups. Aim: The aim of this study is to compare canal volume sealing capacity at different levels from the root apex using various cold and thermal obturating techniques. Materials and Methods: Fifty extracted human maxillary molars were collected with the mesiobuccal root curvature more than 30°. They were divided into five experimental groups (I–V) with ten teeth in each group. Biomechanical preparation was done using ProTaper rotary system. For all the groups, resin-based sealer resinoseal mixed with methylene blue dye (contrast) was used as the sealer. Groups I and II were obturated with 2% and 4% gutta-percha (GP) cones, respectively, using lateral compaction technique. Group III was obturated with 6% GP cones using single cone technique. Group IV was obturated using Thermafil system and Group V was obturated with 6% GP cones using downpack with Touch n Heat (Sybron Endo) device. 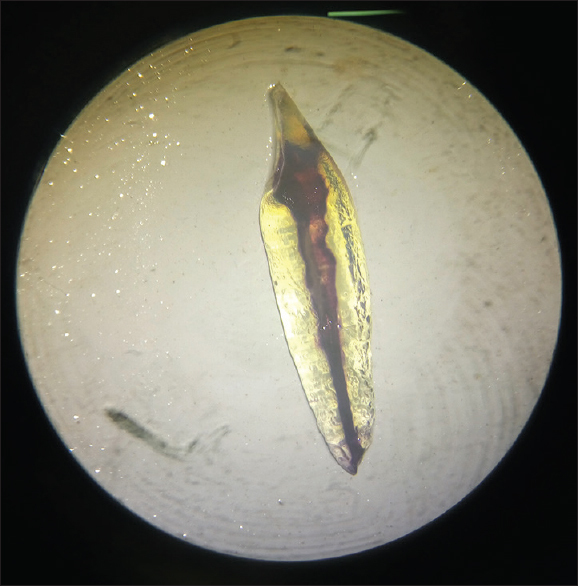 All the specimens were sectioned at different levels, i.e., 3, 6, and 9 mm, from the root apex and three-dimensional apical seal was evaluated under stereomicroscope. Results: The stereomicroscopic images showed that all obturation techniques resulted in good apical seal with comparable results. Six percent single cone obturation technique resulted in poor seal (i.e., 6 and 9 mm from the root apex). The best results were shown by Thermafil endodontic obturators at all three levels from root apex. Conclusion: Although various obturation techniques resulted in achieving good three-dimensional obturation with satisfactory apical seal, only thermal systems were successful in achieving good seal at all the levels from the root apex. 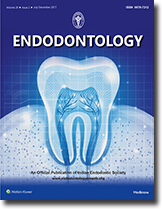 Aim: The purpose of this study was to compare the incidence of postoperative pain in 80 endodontically treated teeth, with and without apical patency, in relation to some diagnostic factors (vitality, presence of preoperative pain, group of treated teeth). Materials and Methodology: Apical patency was maintained during shaping procedures with a #10 K-file in one group (n = 40) and not in the other (n = 40). Root canal treatment was done in single visit. 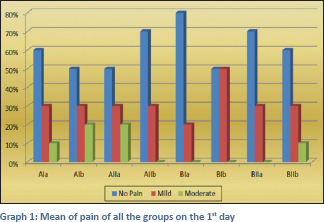 Pain was recorded 1st day, 2nd day and 7th day using VAS scale. Results: There were no statistically significant differences between patency and non patency groups regarding incidence and degree of postoperative pain. Only preoperative pain has significant effect on postoperative pain. Conclusion: Our study concluded that maintenance of apical patency did not increase the incidence of postoperative pain when considering all variables together. Aim: The aim of the study is to evaluate the canal transportation and canal centering ability of WaveOne, ProTaper, and F6 SkyTaper nickel-titanium instrument systems using cone beam computed tomography (CBCT). Materials and Methods: A total of 45 mandibular first molars with a curvature angle ranging from 20° to 40° of the mesiobuccal canal were included and randomly divided into three groups with 15 specimens each according to the rotary systems used: in Group 1, specimens were prepared with WaveOne system, in Group 2, specimens were prepared with ProTaper rotary system, and in Group 3, specimens were prepared with F6 SkyTaper rotary system. CBCT was used as a diagnostic method to evaluate centering ratio and canal transportation at 1, 3, 5, 7 mm from apical foramen. Statistical Analysis: To evaluate canal centering ratio and canal transportation between file systems, one-way analysis of variance and post hoc Tukey tests were used. Results: Statistically, significant differences are well-established between the different files though all the files conserved the aboriginal canal curvature. 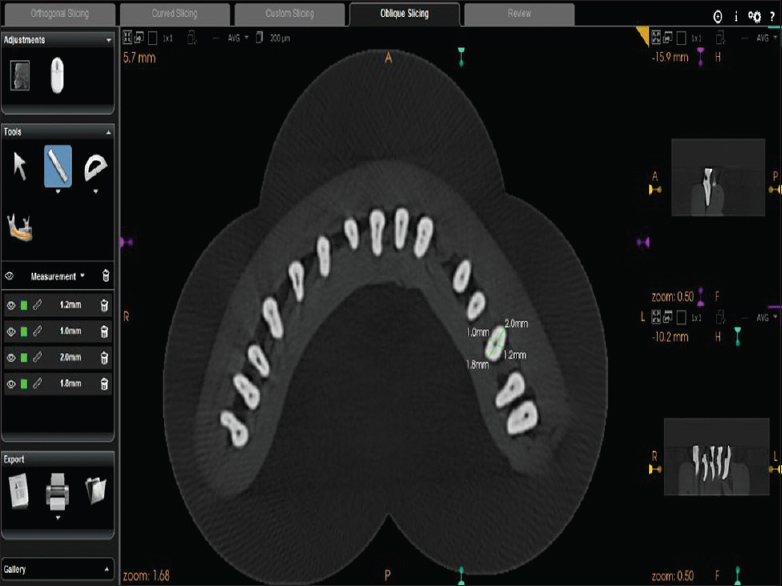 WaveOne files exhibited lesser transportation and stayed better centered in the root canal system than F6 SkyTaper and Rotary ProTaper files. Conclusions: WaveOne files showed slighter transportation and better centering ability than F6 SkyTaper and ProTaper. Aim: The aim of this study was to determine the accuracy of two different apex locators for measurement of working length during root canal retreatment of mandibular molars with two different file systems in an ex vivo study. Materials and Methods: Sample consisting of sixty extracted mandibular first molars was selected. 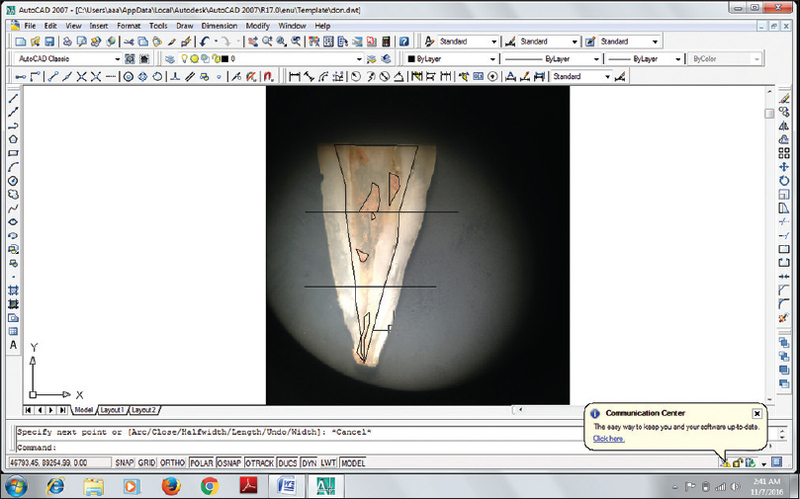 Tooth length was measured with a file. Biomechanical preparation of the roots was done with Protaper files 1mm short of the tooth length. Canals were coated using AH Plus sealer and were obturated with gutta percha. Obturating material was removed after one week with two files i.e Protaper and Mtwo retreatment files. Tooth length was remeasured and recorded as the retreatment tooth length (RTL). Then electronic measurements were taken with Root ZX and Apex ID apex locator as suggested by the instrument display. These lengths were compared with RTL at 0.5 and 1 mm short of this distance. Results: For both canals, no significant difference was found between RTL and EAL measurements with Root ZX apex locator and protaper retreatment files. There was a significant difference between Apex ID apex locator with M2 retreatment files readings. 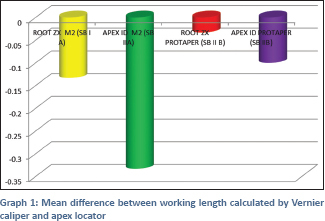 Conclusion: Root ZX apex locator was more accurate as compared to Apex ID apex locator in determining the working length in teeth after removing the root canal obturating material using two different files. Aim: The aim of the following study was to evaluate the effects of three root canal sealer activation techniques on percentage and depth of penetration of SmartPaste Bio and AH Plus sealers using the confocal laser scanning microscopy (CLSM). Materials and Methods: Root canals of sixty teeth prepared till rotary F3 ProTaper size were divided into two equal groups on the basis of type of sealer used: AH Plus (Dentsply–DeTrey, Konstanz, Germany) and SmartPaste Bio sealer (Endotechnologies, LLC, Shrewsbury, MA, USA). Sealers were mixed with Rhodamine B for visibility under CLSM. Each group was further divided into three equal subgroups on the basis of sealer activation technique: (i) Sonic, (ii) ultrasonic, and (iii) manual dynamic. The specimens were obturated with gutta-percha by cold lateral condensation. Horizontal sections at 3 mm from the apex were obtained, and the percentage and depth of penetration of sealers into dentinal tubules were measured using CLSM. Results: Group 1 (ii) showed the highest mean depth of penetration (1260 μm) and maximum mean percentage of sealer penetration (90.004), whereas Group 2 (i) showed minimum mean depth of penetration (492 μm) and minimum mean percentage of sealer penetration (23.7). Statistical significant differences among all the groups were found at the 3 mm level (P < 0.001; analysis of variance - Tukey's tests) for the depth and percentage of sealer penetration. Conclusion: Percentage and depth of sealer penetration are influenced by the type of sealer used and the sealer activation technique. SmartPaste Bio sealer and ultrasonic method of activation gave best results. Aim: Clinical evaluation and comparison of the effect of 2% chlorhexidine gel and triple antibiotic paste with calcium hydroxide on incidence of interappointment flare-up in diabetic patients. Materials and Methods: Thirty-six diabetes mellitus patients seeking endodontic treatment were assigned to three groups: Group I - calcium hydroxide paste, Group II - triple antibiotic paste, and Group III - 2% chlorhexidine gel. Access opening and chemomechanical preparation was done followed by the placement of intracanal medicaments. Samples were then assessed for the incidence of intra-appointment flare-up at 1, 2, 3, 7, and 14 days using verbal rating scale. Obtained scores were statistically analyzed using one-way ANOVA test and Tukey's post hoc test. 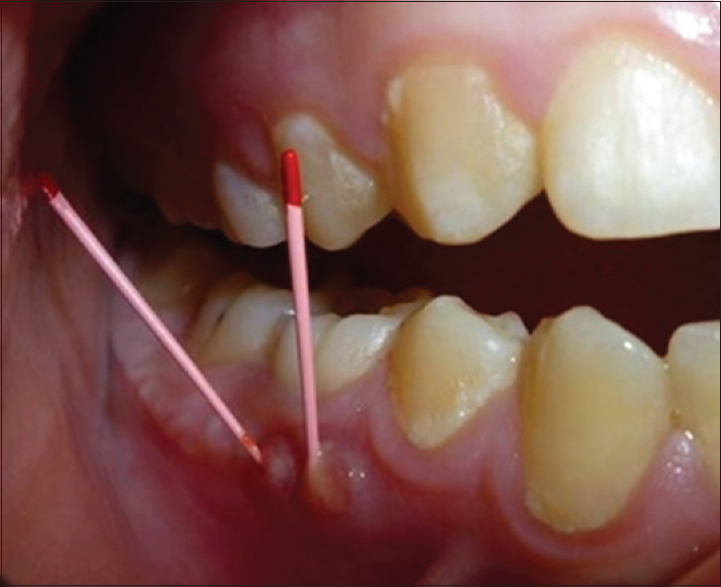 Results: Total incidence of interappointment flare-up was found to be 13%. For all the groups, statistically significant difference (P < 0.05) was seen at days 1, 2, 3, and 7, with insignificant difference at day 14. Intragroup comparison showed statistically significant difference present between Group I and II and Group I and III with (P < 0.05) at days 1, 2, 3, and 7. No statistically significant difference was seen between Group II and III in all 14 days. Conclusion: Both triple antibiotic paste and 2% chlorhexidine gel were significantly effective for minimizing the interappointment flare-up and postoperative symptoms in diabetic patients. 2% chlorhexidine gel found to be more effective clinically, as compared to other experimental groups. 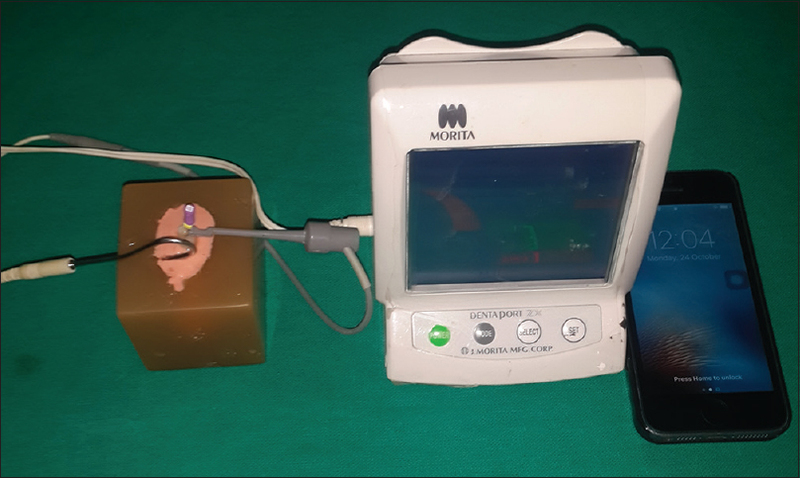 Aim: The purpose of this study was to evaluate the interference of smart phone (Iphone 5s) during working length determination on electronic apex locators (Root ZX and NSK ipex II) function in vitro. Materials and Methods: Two EALs: Root ZX (J. Morita Co., Tustin, CA, U.S.A.) & NSK ipex II were tested for any interference with smart phone during working length determination. The effect of cellular phones on electronic working length (EWL) was determined under 2 experimental settings: 1) in a multispeciality set up with good signal strength 2) in a closed room with poor signal strength and Five conditions a) Control group - No mobile phone in the room b) In close contact with EAL in safe mode c) in close contact with EAL for 30 seconds d) Phone kept at a distance of 35 cm from EAL in safe mode e) Phone kept at a distance of 35 cm from EAL in calling mode for a duration of 30 seconds. The readingswas scored from 1 to 3 and the data was subjected for statistical analysis. Results: Statistical significant difference was obtained when an intergroup comparison was made using two- way repeated analysis of variance. Conclusion: Electronic apex locators tested did not cause inhibition or interfere with mobile phones. Aim: The aim of this study is to evaluate and compare the apical sealing ability of new bioceramic-based (TotalFill BC) and methacrylate-based (Hybrid Root SEAL) sealers with epoxy resin-based (AH Plus) sealer using a dye penetration method. Materials and Methods: A total of 74 extracted mandibular premolars were selected and decoronated to the root length of 14 mm. The root canals were prepared using high flex to size 35, 0.06 taper to the working length. After completion of the biomechanical preparation of root canal, samples were divided into four experimental groups (n = 16) and two control groups (n = 5). Experimental groups were obturated as follows - Group A: Obturated with AH Plus + 6% conventional gutta-percha, Group B: Obturated with TotalFill BC + 6% conventional gutta-percha, Group C: Obturated with TotalFill BC + 6% bioceramic gutta-percha, and Group D: Obturated with Hybrid Root SEAL + 6% conventional gutta-percha. Results: The best results were obtained with TotalFill BC with bioceramic gutta-percha followed by TotalFill BC with conventional gutta-percha, AH Plus, and Hybrid Root SEAL. Conclusion: Bioceramic sealer with bioceramic gutta-percha or conventional gutta-percha provides comparable sealing ability to AH Plus and superior to Hybrid Root SEAL. 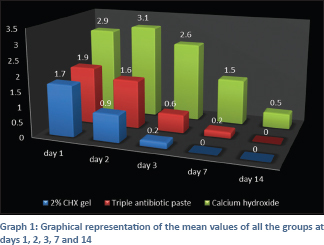 Aim: The aim and objective of this in vitro study was to evaluate antimicrobial efficacy of root canal sealers (bioceramic [BC] sealer, Epiphany self-etch sealer, AH-Plus sealer) on Enterococcus faecalis. Materials and Methods: An agar well diffusion assay method was used to determine the efficacy of the root canal sealer against E. faecalis (ATCC 29212). Root canal sealers were divided into three groups; BC sealer, Epiphany self-etch sealer, and AH-Plus sealer, and standard antibiotic disc of co-trimoxazole was kept as a control. The diameters of the growth inhibition zones against E. faecalis for each group were recorded and compared at 24 h and 48 h. The differences between groups were analyzed by one-way ANOVA and Tukey's post hoc tests for intergroup analysis. Results: AH-Plus sealer exhibited larger zone of inhibition than BC sealer and Epiphany self-etch sealer against E. faecalis at 24 and 48 h. Antibiotic disc of co-trimoxazole, which was used as control exhibited the highest antimicrobial activity against E. faecalis at 24 and 48 h. Epiphany self-etch sealer showed least antimicrobial activity. Conclusion: The AH-Plus root canal exhibits better antibacterial action against E. faecalis at 24 and 48 h.
Objective: To assess the influence of different agitation protocols on the penetration of an endodontic irrigating solution into dentinal tubules. 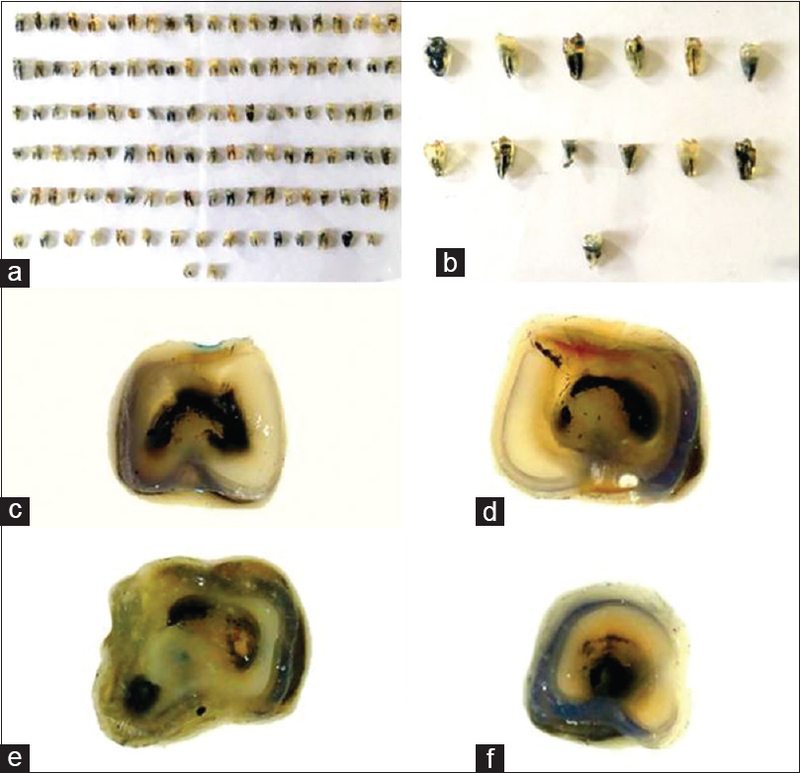 Materials and Methods: Forty extracted single-rooted human teeth were cleaned and shaped using nickel-titanium instrumentation with intermittent irrigation. Final rinse was performed using 5% sodium hypochlorite labeled with 0.2% alizarin red dye. 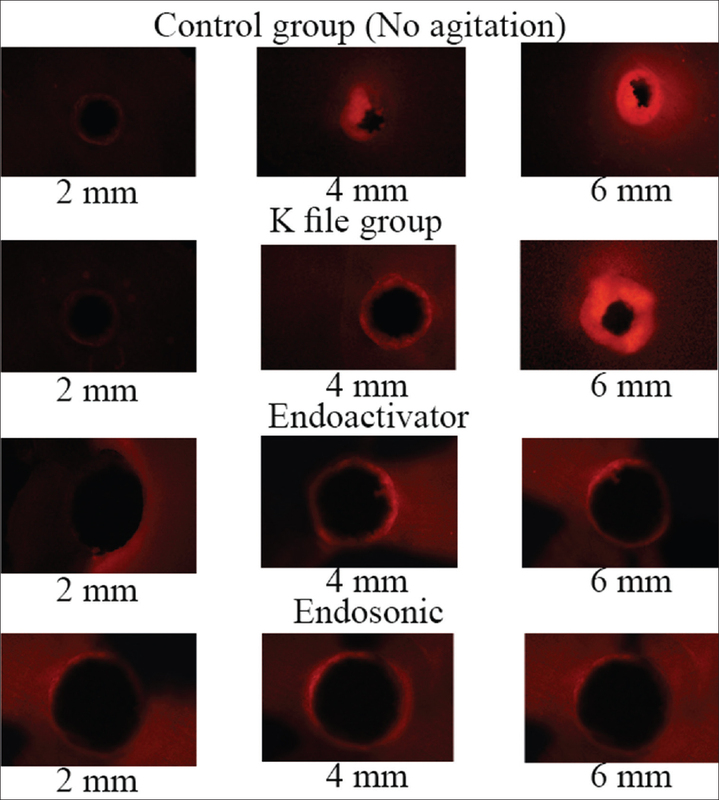 Specimens were randomly assigned to four groups (n = 10), namely, control group (no agitation), K-file group, EndoActivator group, and endosonic group. Specimens were then sectioned at 2, 4, and 6 mm from the apex in 40 μm thick sections and prepared for fluorescence microscopy at ×100. Irrigation penetration was analyzed using Kruskal–Wallis analysis of variance followed by post hoc comparisons. Results: Groups were ranked in the following order: control (no agitation) ~K-file < EndoActivator < endosonic. Conclusion: Ultrasonic agitation increases penetration of endodontic irrigant into the dentinal tubules. Negotiating the dilacerated and S-shaped roots often present a challenging situation in their Endodontic treatment. An insight of canal anatomy, coronal preflaring, precurving of all the hand instruments and use of smaller number files facilitates easy negotiation of canal curvature and maintenance of the shape without any procedural mishaps. All hand files are used in present cases with balanced force technique which has advantages of less extrusion of debris, less iatrogenic errors, and maintenance of instrument centrally. A thorough assessment of preoperative radiographs coupled with careful approach yielded into a safe and a successful endodontic treatment of such teeth. 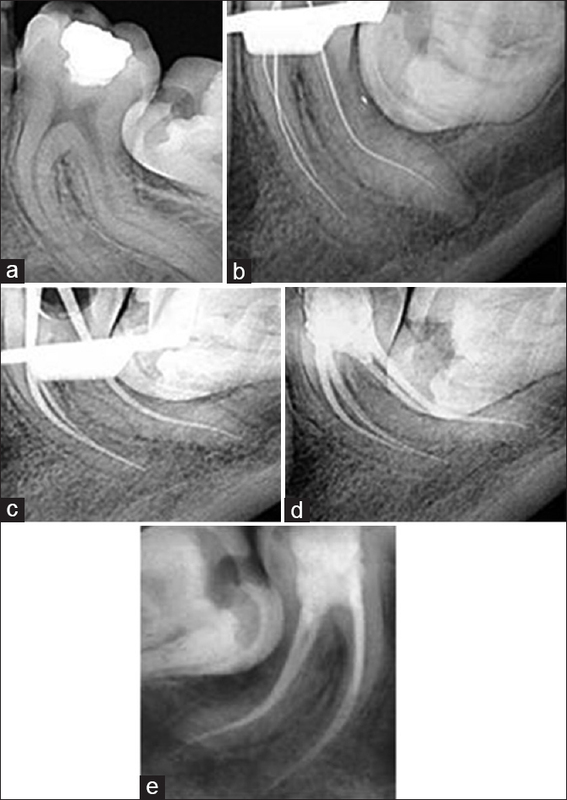 This case series presents two such interesting cases of endodontic management of curved canals. Physiological root resorption is a known phenomenon for deciduous teeth with uncertain etiologic factors. The initiation of root resorption could be due to the injury or the infection of the pulp. The physiological, esthetic, and functional consequences of treating primary teeth without permanent successors make it a unique challenge. 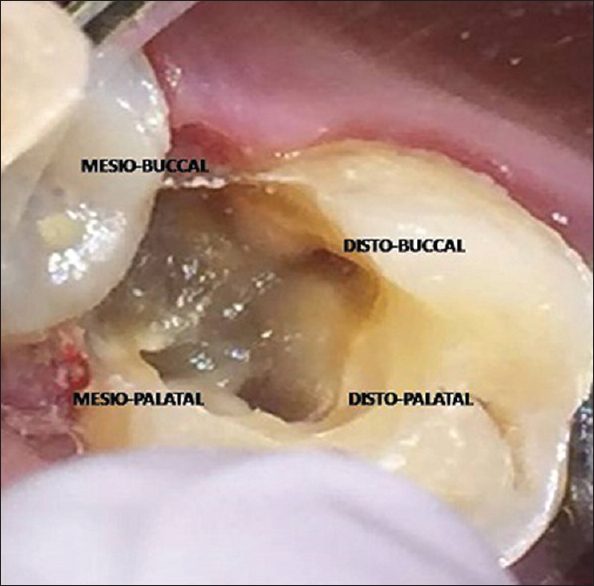 The aim of this article was to present the treatment, and long-term follow-up of a case in mineral trioxide aggregate (MTA) was used in the pulpectomy of a nonvital primary molar with no permanent successor in a 14-year-old child. The treatment was root canal treatment and total obturation using MTA. Follow-up examinations were done and showed a radiographic healing of the periapical radiolucency and resorption of mesial root. Furthermore, the tooth was asymptomatic and clinically functional. Dental invagination is a tooth malformation induced by the invagination of the enamel organ before calcification has occurred. Type 2 invagination is prolonged into to the main root canal and do not communicate with the periodontal space. When pulp necrosis occurs in such type of invagination, performing rigorous root canal treatment in these aberrant anatomy represent a real the therapeutic challenge. Therefore, removing the anatomical aberration and redesigning the root canal space may be the best treatment choice to achieve these objectives. 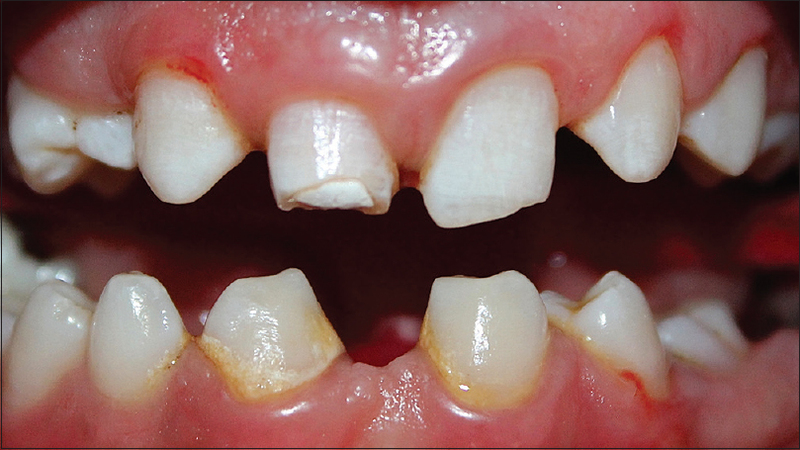 The aim of this paper is to describe an unusual case of type 2 dens invaginatus on permanent maxillary central incisor in a patient presenting a hypodontia and planned for an orthodontic treatment. Morphological variations are frequently observed in the roots of maxillary molars. Thorough knowledge of the root canal morphology and canal anatomy is mandatory for the success of the root canal procedure and the novel diagnostic aids such as four cone-beam computed tomography (CBCT) aids in the successful management of these cases. This case report describes the successful diagnosis and treatment of a maxillary second molar with two separate palatal roots using CBCT.